TALLAHASSEE, Fla. – During today’s meeting of the Florida Cabinet, Governor Rick Scott and Volunteer Florida CEO Chester Spellman recognized two deserving Champions of Service: Charles “Skip” Cramer, a longtime volunteer with the American Red Cross of Northeast Florida, and Michael “Mikey” Attardi, Jr., who volunteered to serve families and individuals impacted by Super Storm Sandy. Charles “Skip” Cramer, a retired Navy Captain, served as CEO of the American Red Cross of Northeast Florida for ten years before becoming a volunteer. With a strong interest in military families and veterans, Mr. Cramer furthers the Red Cross mission to provide comfort and care to members of the Armed Forces. Michael “Mikey” Attardi, Jr., is a 12-year-old student at Lake Whitney Elementary School in Windermere. In the wake of Super Storm Sandy in 2012, Mikey worked for almost two weeks to collect clothes, food, water, and other essential items to assist victims of the storm. Thanks to these efforts and generous donations from Floridians, 16 large boxes of supplies were filled and shipped to Long Branch Middle School in New Jersey, arriving a week before Thanksgiving. The supplies helped 200 people who were sheltering at the middle school because they could not go home. Volunteer Florida is the lead agency for Emergency Support Function (ESF) 15 for the Florida Division of Emergency Management, coordinating volunteers and donations during disasters and emergencies. To learn more about Volunteer Florida’s role in emergency response, click here. 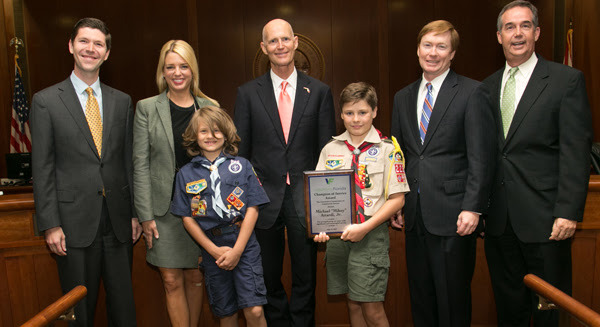 The Volunteer Florida Champion of Service Award honors individuals and groups for their outstanding volunteer efforts. For more information about the Volunteer Florida Champion of Service Awards, click here.